LOS ANGELES (CN) – A Los Angeles councilman on Wednesday introduced a plan to move an Asian elephant from a zoo to a sanctuary despite objections from zoo officials who say animal advocates have spread misinformation about the elephant’s well-being. Fifth District Councilman Paul Koretz introduced a motion at the Los Angeles City Council morning meeting to move Billy the elephant from the LA Zoo because he said the elephant did not have adequate room to roam. Billy, who is 32 years old, has been at the zoo for 27 years. Animal advocates say he has exhibited abnormal behavior, such as repeatedly bobbing his head, because he does not get the exercise he needs. He shares his enclosure with two female elephants, Tina and Jewel, but is separated from them by a corral. The group Voice For The Animals has mounted a “Free Billy” campaign. In addition to circulating a petition, the group will hold a comedy fundraiser in May to back its effort to move the pachyderm from the exhibit that opened in 2010. 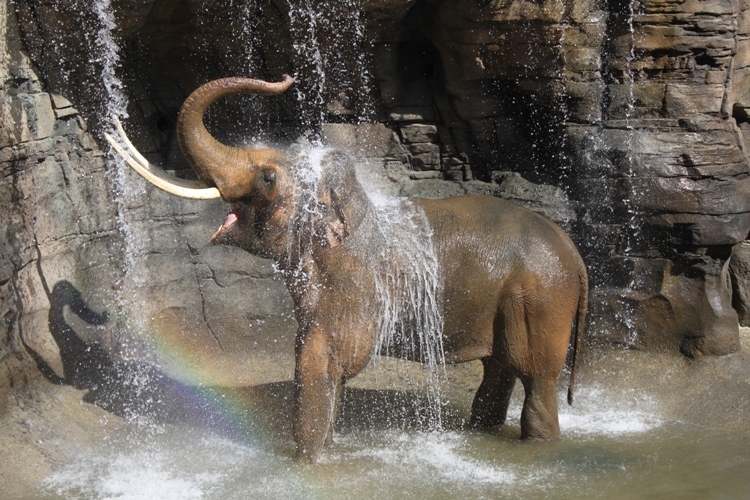 Melya Kaplan, founder of Voice For The Animals, said that the 6.56-acre habitat at the zoo that Billy shares with the two other elephants is too restrictive. The LA Zoo invited the media to the Elephants of Asia habitat on Tuesday to tour what it says is a “state-of-the-art” facility. The zoo pointed to “persistent misinformation and inaccuracies” regarding the elephants’ welfare. Zoo officials contend that the exhibit exceeds California Fish and Wildlife, U.S. Department of Agriculture and Association of Zoos and Aquariums standards. The facility has three acres of outdoor space, bathing pools, a waterfall, and sandy hills. Zoo Director John Lewis said that the three elephants touch and share food despite the corrals separating them. “The barrier is there because the two girls are post-reproductive cows and we don’t want to take the risk that they might be bred by Billy because that would be really bad for them,” Lewis said Tuesday. Lewis said Billy only exhibits the head-bobbing behavior at feeding time. “He uses the bobbing in anticipation of his keepers, when he hears them in the barn, when he knows it’s time to get fed,” Lewis said. Kaplan said it was “insane” for officials to link feeding time to Billy’s behavior. “It’s not about food, it’s about boredom. It’s about depression. It’s about the fact that he has nowhere to walk,” Kaplan said. This isn’t the first time the elephant exhibit at the zoo has come under scrutiny. In August 2007, Los Angeles resident Aaron Leider sued Lewis and the City of Los Angeles, challenging the expansion of the exhibit. Leider said Billy had been kept in isolation from other elephants and that a keeper had shocked him. In 2012, Los Angeles County Superior Court Judge John Segal stopped short of ruling that the zoo’s treatment was inhumane but said that the zoo needed to take better care of the elephants. Although the case is currently on appeal, Koretz’s’ motion, which was seconded by Councilman Mitch O’Farrell, calls for the LA Zoo to comply with Segal’s order. Koretz’s motion also notes that the zoo has collected genetic material from Billy to breed other elephants in North America. The city council’s Arts, Parks and River Committee will next consider the motion, which also calls for the creation of an animal welfare oversight committee.